This post is sponsored by Campfire® Marshmallows. All opinions expressed are as always, 100% my own. It’s not often that I succumb to cutesy desserts. Search the entire blog and you will find very few fussily decorated treats as I’m typically a taste over looks kind of girl. Maybe it’s an attention span thing. Who knows? But being the mom of two little kids, I occasionally indulge in a touch of whimsy every now and then. A very little touch. 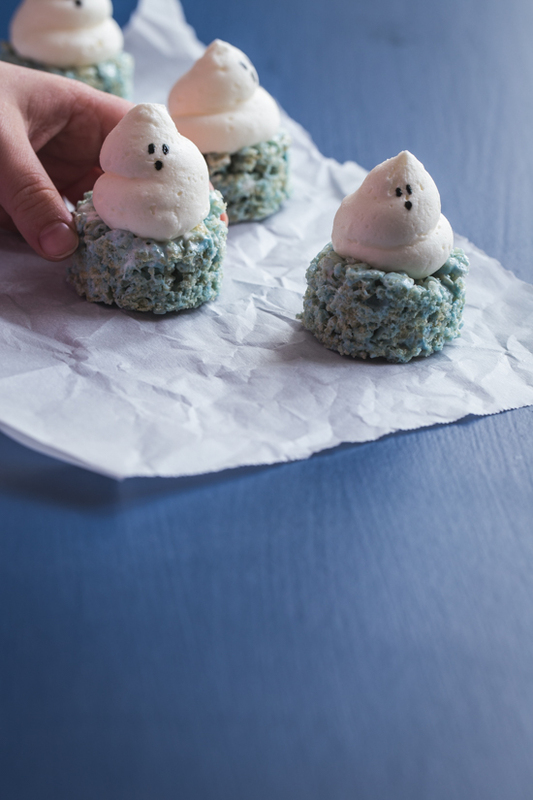 Teeny Halloween marshmallow treats with buttercream ghosts fall under the category of ‘a very little touch’. Tuesday was the Baby’s 5th birthday. And while she is getting big, and by every other normal person’s standard is by no means a “baby”, she is and will forever be my Baby. I tell her that on a daily basis. Well, with her birthday being so close to Halloween, I tend to to sneak in a bit of the holiday into her birthday. Being the proud preschooler that she is, she wanted to bring a ‘fancy’ treat into school to share but it needed to be kid friendly, peanut-free and easy enough to whip up late on a Monday night. Is there anything easier and more universally loved than marshmallow treats? If there is, I don’t know about it. 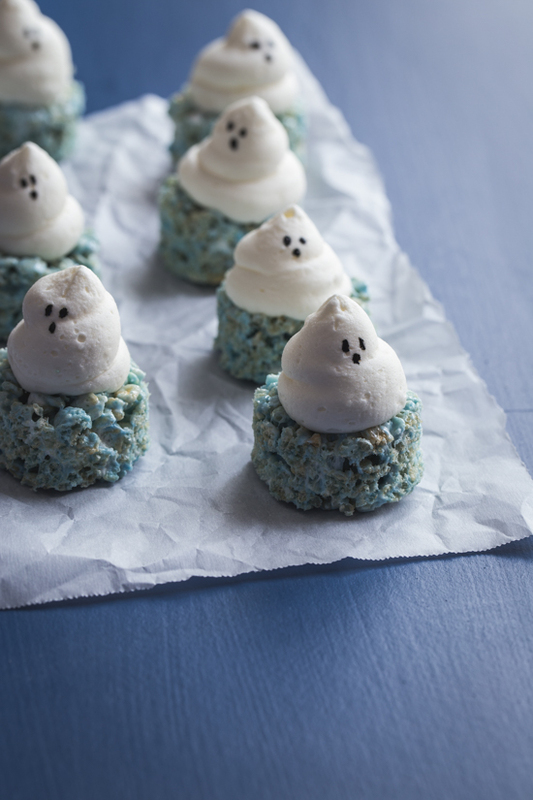 What makes these treats special, besides the adorable little ghosts on top, are the Campire® Marshmallows Scary Berry marshmallows. 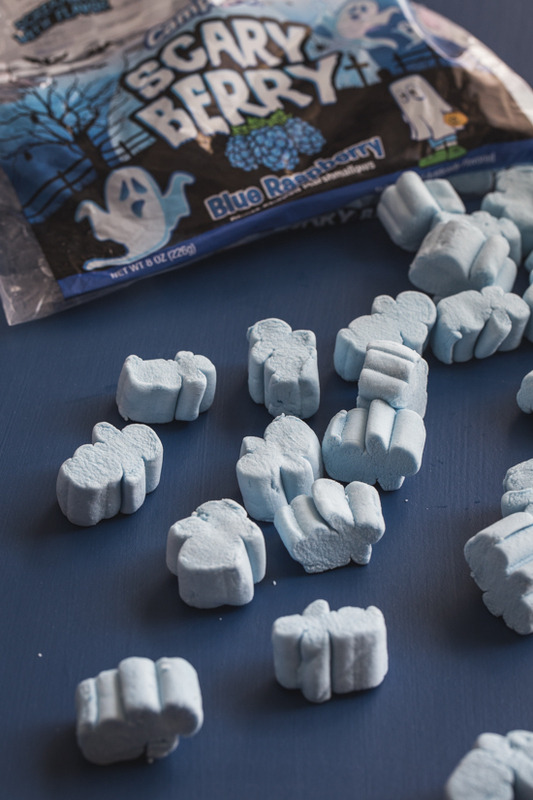 They’re tangy and sweet, but if you can’t find them you could use their Blue Raspberry Mallow Bursts, instead. The buttercream is a fabulous recipe that I got from my favorite baking guru, Jamie. She and I have paired up with Campfire® Marshmallows this year to share all sorts of fun marshmallowy treats. If you’re as big of a marshmallow fan as we are, be sure to check out our Marshmallow Madness Pinterest board. Now I have to admit that the very best thing about this entire recipe was the look on my sweet little girl’s face as we walked into her classroom on Tuesday to show off her “fancy” birthday treat. And as much as making little cutesy desserts goes against my grain, I would make her anything she wanted for her birthday. 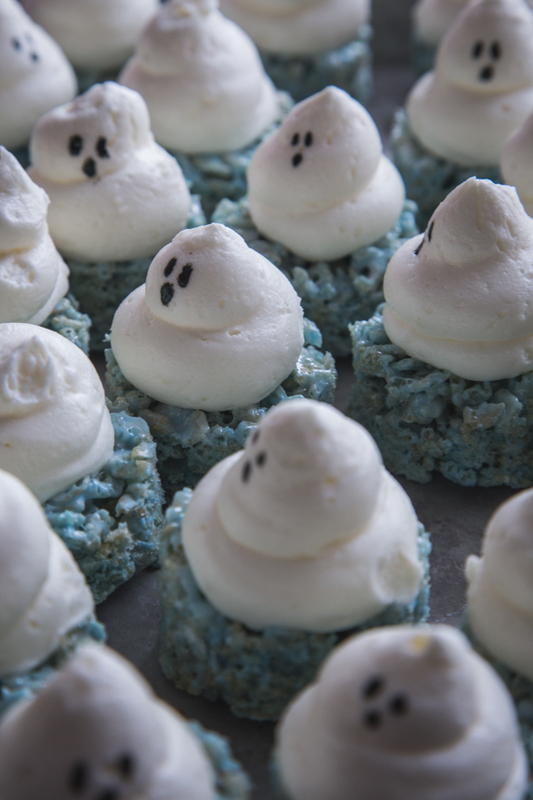 Especially if it’s as easy as these chubby little ghosts. I mean, come one. Look at those little faces! In a large heavy bottomed pot, melt butter over medium heat. Stir in Scary Berry marshmallows and 2 cups of mini marshmallows until melted. Remove from heat and add cereal and remaining 1 cup of mini marshmallows. Stir to combine. Spread into a greased 9x13 pan and let cool completely (about 1 hour). When the treats are cool, use a 1 1/2 inch biscuit cutter to cut out 28 small circles from the treats (or cut into 2 inch squares with a knife). In the bowl of a stand mixer fit with a paddle attachment, cream butter until very light and fluffy, about 5-6 minutes. Add powdered sugar, 1/2 cup at a time, mixing on low until incorporated. Turn mixer to high to fully combine. Add vanilla and milk and mix on high until buttercream is very fluffy. Transfer buttercream to a piping bag fit with a jumbo piping tip. 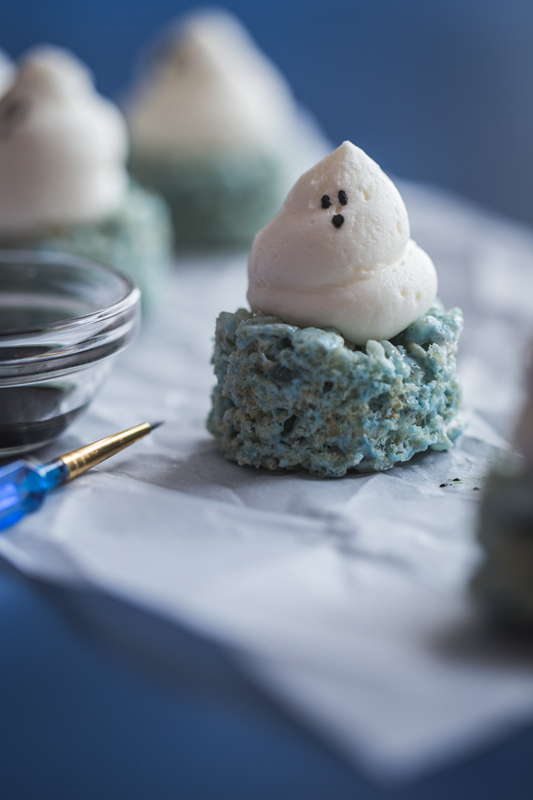 Pipe small ghost shapes onto each marshmallow treat. Use food color pen or food color and small brush to create the ghost faces. Serve up your spooky treats and enjoy! 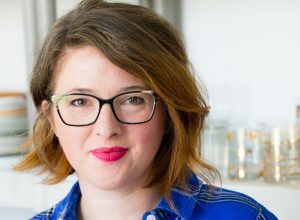 These are just too darn cute, Emily! I am sure C’s classmates just loved them! Thanks so much, Dorothy! It’s so hard to believe she’s already 5! I’m such a cliche, but time flies so fast! 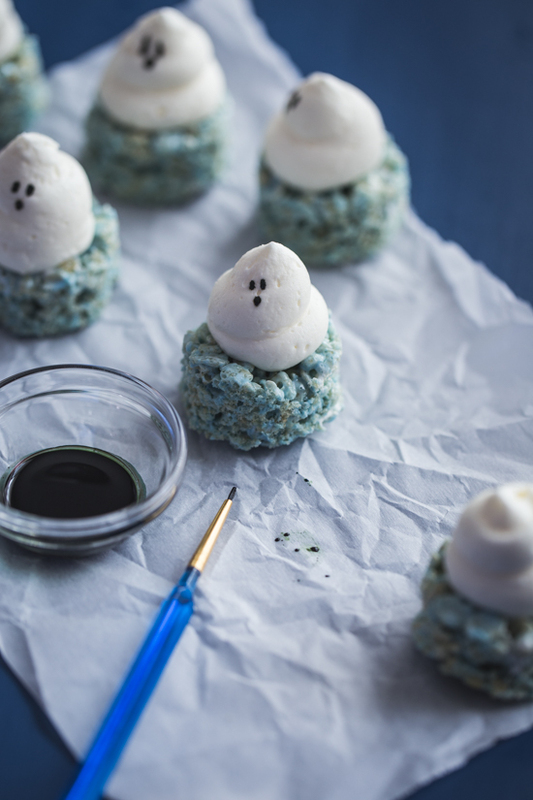 These are hands down the best Halloween inspired treats I have seen lately. 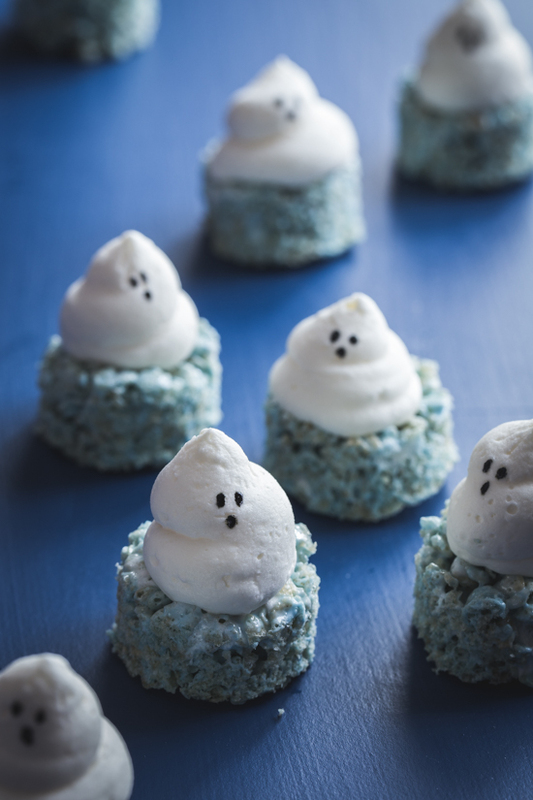 The little meringue ghosts are just SO cute I almost wouldn’t want to eat them!